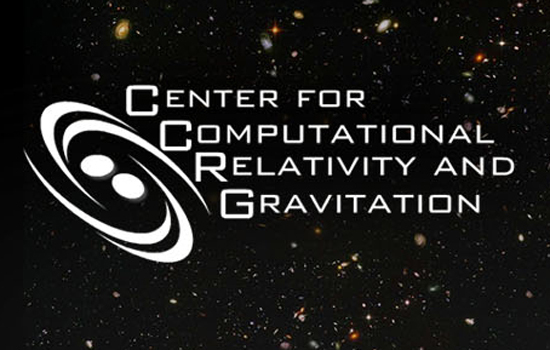 Rochester Institute of Technology’s Center for Computational Relativity and Gravitation is a research hub in RIT’s College of Science and an RIT Research Center of Excellence. The center, established in 2007, consists of 26 members, including 10 faculty, administrative staff, postdoctoral researchers, and Ph.D. students as well as undergraduate researchers. Signature projects at the center simulate the merger of binary black holes on supercomputers using various permutations of masses and spins. Other research projects explore gravitational wave detection for the Laser Interferometer Gravitational Observatory (LIGO) Scientific Collaboration, numerical relativity, supernovae explosions, galactic dynamics, high-performance computing and scientific visualization. Faculty members affiliated with the center hold positions in three different colleges at RIT: the School of Mathematical Sciences and the School of Physics and Astronomy in the College of Science; the Department of Computer Science in the B. Thomas Golisano College of Computing and Information Sciences; and the Department of Science and Mathematics in the National Technical Institute for the Deaf. The center is also affiliated with the astrophysical sciences and technology Ph.D. program and MS graduate programs—applied and computational mathematics, computer science and data science. Nearly $8 million in research funding from the National Science Foundation and NASA, and allocations at national computing laboratories, support research at the center and have made it an RIT Research Center of Excellence. Scientists at the center played landmark roles in astrophysical history in 2005 by simulating for the first time the forms of gravitational waves emitted by colliding black holes using supercomputers. The LIGO Scientific Collaboration used these simulations as templates for the first direct observation of gravitational waves. Other scientists at the center analyzed and interpreted the wave signals detected by Advanced LIGO that confirmed the 2005 prediction.